Medical researchers are just beginning to uncover the complexities associated with alcohol addiction. There is not one individual factor that will cause a person to become addicted to alcohol or dependent on this drug, but rather a wide variety of factors ranging from social to emotional and environmental factors. One person may be addicted to alcohol because of genetics and a tendency to drink excessively, while another person may find themselves reliant upon this drug because they drank alcohol as a coping mechanism for another mental health disorder. Regardless of the cause of addiction, patients need to work to find a treatment option that helps them achieve and maintain sobriety. Alcohol addiction affects people of all social classes and demographics. For the affluent people who are hoping to overcome addiction, luxury alcohol treatment recovery centers are available. In 2007, nearly 357,000 Maryland residents reported that they were addicted to alcohol or reliant upon the drug in order to live their daily lives. As is the trend across the country, most of those people never received the treatment that they needed in order to become sober. 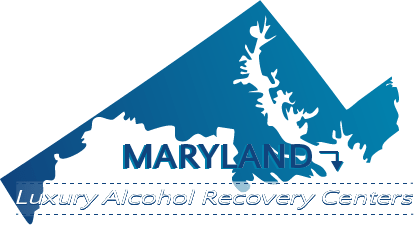 In fact, 339,000 alcohol addicts in Maryland reported that they most likely needed treatment in order to overcome their dependency on alcohol, but they did not seek it. There are many reasons why people avoid getting the treatment they need. Some people who are addicted to alcohol are in denial and will not admit that they have a problem. Others are not aware of the treatment options that are available. For instance, affluent people may be in high-powered positions within large corporations or firms, and may feel embarrassed about the fact that they need to seek treatment. It’s important to note that all treatment centers offer privacy and confidentiality for their patients, but luxury treatment facilities increase the privacy of their services. The median household income in Maryland is about $71,000 per year, which is significantly higher than many other states in the country. With this fact in mind, there are many residents in Maryland who could benefit from luxury alcohol treatment recovery centers. Luxury alcohol treatment recovery centers specialize in making addiction treatment services as comfortable as possible for the patients. The majority of luxury treatment facilities offer residential treatment options for patients, allowing them to escape the challenges of daily life and focus completely on their recovery journey. While most conventional inpatient programs require patients to have a roommate, many luxury facilities offer private accommodations for patients who are interested. These treatment centers also are known for their advanced medical care and their alternative treatment options, with most luxury centers offering holistic care programs for patients who want to pursue an alternative care plan. In addition, luxury treatment centers create a resort-like atmosphere for the people who are enrolled in the programs. Amenities such as swimming pools, spas, horseback riding trails, golf courses, and tennis courts are available at most luxury alcohol treatment recovery centers. Serenity Acres Treatment Center LLC is a well-known luxury facility based out of Annapolis. It offers both short-term and long-term inpatient programs that last for 30, 60, 90, or 120 days. It specializes in dual diagnosis treatment, and also specializes in treatment for patients with HIV or AIDS. Mann House Inc. is based out of Bel Air, and provides luxury treatment options for men. Long-term residential programs are available at this facility, as are after-care addiction services that help ensure that patients have the support they need after they complete their initial recovery program. In order to find out more information about luxury treatment centers in Maryland, contact us at AlcoholTreatment.net today. After you place your confidential call, you will be connected to a gentle and caring counselor who will help you find the facility that meets all of your needs.